The alternative system that is already on the market is a micro-CHP (combined heat and power) unit based on the Stirling engine. The UK government is increasingly promoting micro-CHP as part of its strategy to reduce CO2 emissions, especially in the domestic sector. It is interesting how two nineteenth century technologies, the fuel cell and the Stirling engine, are only now coming into their own. 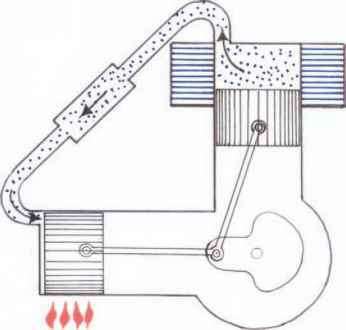 Invented by Robert Stirling in 1816, the eponymous machine is an 'external combustion engine' because the heat is applied to the outside of the cylinder. It is a viable technology because of advances in piston technology and in materials like ceramics from the space industry and high-temperature steels, allowing temperatures to rise to 1200oC. It is now considered a firm contender for the small-scale micropower market. 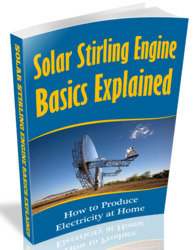 The operational principle of the Stirling engine is that a fixed amount of gas is sealed within the chamber of the engine, usually helium, nitrogen or hydrogen. 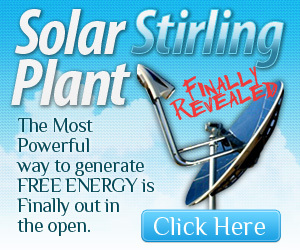 The Stirling engine works on the basis that when heated the gas will expand. 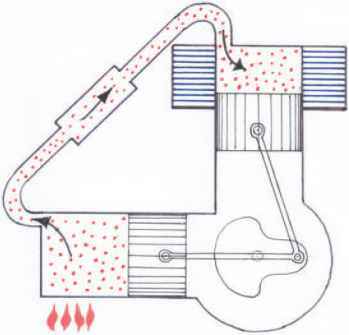 Heat is applied to one end of the chamber using a possible variety of fuels to 750-800OC. The increased pressure within the cylinder forces down the power piston. In the basic design a second element, the displacer piston, seals off the hot end of the engine, forcing the gas into a water-cooled chamber. Here the gas contracts, drawing the piston back to the top of its stroke, compressing the gas in the process ready to be heated for the next power stroke. The displacer piston then seals off the cool end of the system. • hermetically sealed free piston Stirling engines (FPSE) in which electricity is produced by an alternator within the sealed chamber. This operates with two separate power cylinders, one 'hot' and the other 'cold'. As it implies, the former sits within the high-temperature heat exchanger and the cold inside the cooling heat exchanger. The four-phase cycle is illustrated in Figs 9.2 to 9.5. Commercial Stirling units often have a multicylinder configuration which dispenses with the displacer piston. Four cylinders are arranged axially and connected to a 'swash plate' or 'Wobble yoke' (WhisperGen) that converts the linear action to rotary drive for three-phase electricity generators. The reciprocating motion of any two cylinders is 90 degrees opposed. 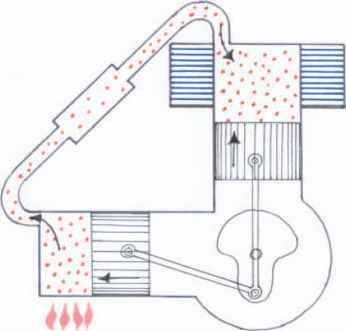 The expansion space of the cylinders is maintained at high temperature by the constant combustion of fuel via heating tubes. The compression spaces are kept constantly water-cooled. A third heat exchanger is the regenerator positioned alongside the cylinders. 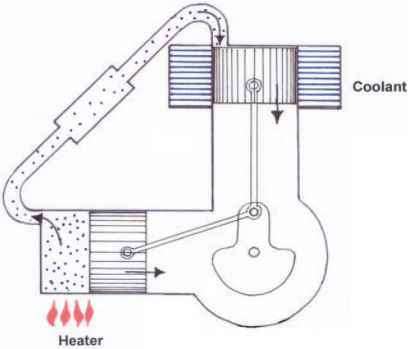 This absorbs heat and then returns it to the hydrogen thereby improving energy efficiency (see Fig. 9.6). For some years the market in the UK has been dominated by WhisperTech, a New Zealand company marketing the 'WhisperGen' domestic CHP system. It provides domestic hot water and space heating along with electricity. It produces 5kW of usable heat and ~800 W of electricity. As there is no combustion stage, this particular Stirling engine is relatively quiet in operation, producing 44dBA at 7 m. It is this characteristic which made it popular for operation within submarines where sometimes silence is golden. This is also a feature which makes it ideal as a replacement for a conventional domestic boiler. It does not require lubricants and servicing need only occur about every 10,000 hours. It is normally linked to a conventional independently heated boiler. The US manufacturer STM Power (Stirling Thermal Motors) produces engines with a capacity of 55 kilowatts of electricity for small commercial premises and groups of domestic properties. With heat derived from biogas from landfill or anaerobic digestion it is as near carbon neutral as is possible. 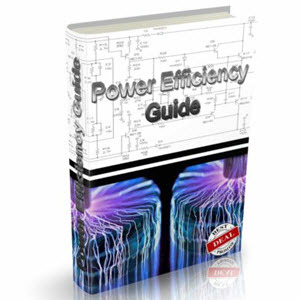 STM Power claims 30% electrical efficiency and a total efficiency of 80% in CHP application (see Figs 9.7 and 9.8).